6 Health Benefits of Jalapenos | Eat This! Jalapeño peppers are named after Xalapa in Mexico, where they were originally cultivated. Chili peppers have been cultivated in Mexico and Central America for over seven thousand years and used as a foodstuff and medicine too. In the 15th century that chili peppers were introduced to the rest of the world as a substitute for black pepper, which was very expensive then as it had to be imported from Asia. Ferdinand Magellan is credited with bringing them to Africa and Asia, where they have long since been incorporated into cuisine and medicine. 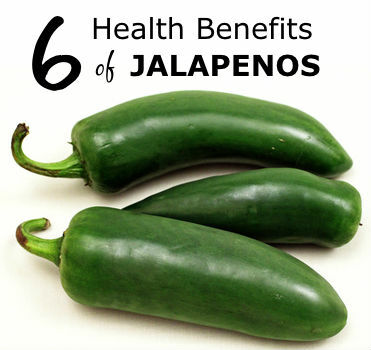 Here are six health benefits of jalapenos. Studies have shown that jalapeño peppers may provide pain relief for migraine headaches. Capsaicin, the chemical that makes chili peppers hot, is known to inhibit a key neuropeptide, Substance P, that is the key brain pain transmitter. Capsaicin may help to defend heart health by reducing cholesterol, triglycerides and platelet aggregation. It may also help the body dissolve fibrin, which blood clots need in order to form. Furthermore, cultures throughout the world that take full advantage of spicy hot peppers in their meals have significantly lower rates of heart attack and stroke than the rest. Jalapeños are also high in vitamins A and C, and in bioflavinoids that help strengthen blood vessels, making them more elastic and better able to adjust to blood pressure changes. The capsaicin in jalapeños not only burns the tongue, but according to studies it makes prostate cancer cells commit suicide (apoptosis). On top of that, the flavonoids and vitamins in jalapeno peppers are excellent antioxidants, preventing cancer by stopping cell damage. Capsaicin is a potent anti-inflammatory agent. It inhibits Substance P, which is associated with inflammatory processes, much like it relieves headaches and migraines, mentioned above. Capsaicin may also one day be a treatment for arthritis, psoriasis and diabetic neuropathy. The capsaicin in jalapeños makes them what’s known as a thermogenic food. Thermogenic foods actually burn away calories and fat, giving you that leaner, healthier figure you’ve been looking for, without even going to the gym! It is well known for these properties and commonly found in a cornucopia of weight loss pills and dietary supplements.